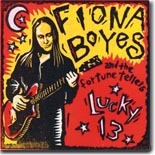 I first met Fiona Boyes in 2003 at the outdoor stage next to King’s Palace in Memphis. She was playing the day after that year’s W.C. Handy awards and I was curious to hear whether all of the IBC buzz I’d heard about her was true. What I found was an articulate artist who was true to her music, and I enjoyed her playing so much that I purchased two CDs from her that day. And while I’ve not heard her previous album, Live In Atlanta, it was a pleasure to hear from Michael Powers of Yellow Dog Records and receive her latest CD, Lucky 13, in the mail for review. Lucky 13 is a very strong record that most likely will bring Fiona’s name to the tongues of many a listener. Ably produced in Austin, Texas by Kaz Kazanoff and featuring guest stars Bob Margolin, Marcia Ball and the Texas Horns, Lucky 13 demands your attention and commands your respect as a listener. This is a brilliant US debut album from an Australian artist we’ll be hearing about for a long time to come. Margolin brings his slide guitar to the forefront on Fiona’s “Good Lord Made You So.” Her man is like the wind, sometimes he’s here, other times he’s gone away. “I ain’t had no rest, no peace…you know that ain’t a lie..no rest, no peace…that man of mine keeps sliding on by.” Her man can’t help it, it’s just the way the good Lord made him be. A strong guitar intro by Fiona leads us into “Stranger in Your Eyes.” This time her man is just not what she thinks he is, “I see a stranger where I once saw a friend.” Disappointed by the man he is, Fiona confronts him with the truth and since he’s been doing her wrong, it’s time for him to move on. A wonderful sax solo by Kaz highlights an outstanding tune by Fiona, with nice accordion accompaniment from Joel Guzman. “I see a weak man where a hero used to stand.” This one just can’t have a happy ending. Margolin’s slide work returns in “Red Hot Kisses”. “Ever since I kissed you I’ve tried to forget….your red hot kisses….you have red hot kisses but a cold, cold heart.” Both Fiona and Bob seem to regret the hot moment of passion that confounds them both. “I thought you were an angel that I saw in my dreams…Now I’m having nightmares and I’m almost bout to scream.” This train wreck is going to do nothing but end badly for both of them. Lucky 13 is one of the top two female contemporary blues albums I’ve listened to all year and puts Fiona into some elite company when the powers that be decide on the nominees for next year’s Blues Music Awards. This is an impressive album by a female artist who not only plays a mean guitar but shows musical sensibilities way beyond her age. Fiona’s true to her roots, respectful of those blues legends she admires and proves beyond a shadow of a doubt that she’ll be a force to reckon with for a long time to come.